Cornell has announced that it will answer the call issued by New York City Mayor Michael Bloomberg to create a world-class applied science and engineering campus in the city. The formal request for proposals was released July 19. Kent Fuchs, provost of Cornell; Lance Collins, dean of the College of Engineering; and Daniel Huttenlocher, dean of Computing and Information Science, recently answered questions about why Cornell is the right choice for developing a New York City technology campus. Q: How committed is Cornell to the New York City tech campus initiative? Kent Fuchs: 100 percent. We already have expertise in key areas for the New York City tech sector, and the city itself is part of our destiny. We have programs and initiatives in the city already, and technology and applied sciences are exactly the areas in which we are committed to growing. The urban environment gives us the ability to create technology transfer, contribute to the state of New York and specifically New York City's economy. The project will allow us to implement these plans in a much bigger and faster way. This is part of our focus for the future and part of our outreach mission. 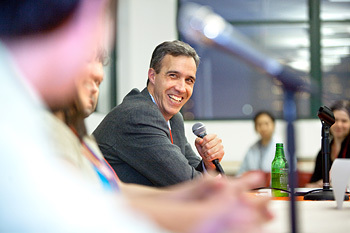 Daniel Huttenlocher, dean of Computing and Information Science, at an event in New York City. Photo by Janet Charles Photography. 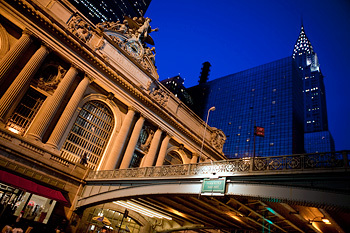 Q: What is a 'technology ecosystem,' and how is Cornell going to support one in New York City? Dan Huttenlocher: By this we mean a collection of companies at different stages of development -- [from] very early startups tying back to things going on in research labs and universities [to] larger corporations that might be customers or potential acquirers for what those smaller companies are doing. The pace of developing new companies is getting faster and faster, and the key factor is getting the right people into an environment where they can focus on and solve the most relevant technology problems. That's what we're looking to do at Cornell, and this is something that I think will be a real benefit to both the university and the city -- to help speed up and fuel that technology ecosystem in New York City. Q: What kind of experience does Cornell have in developing and running a remote campus? 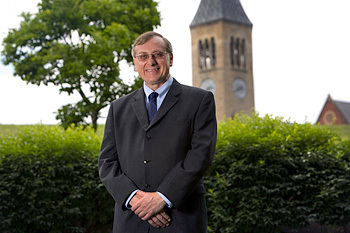 Fuchs: Cornell has a history of developing programs in New York City, where we have our Weill Cornell Medical College -- now engaged in a $1 billion capital project that includes a new medical research facility -- and each of our colleges has academic and research programs within the urban environment offered by New York City. We also have experience overseas -- our medical school in Qatar, which we launched 10 years ago and is the only accredited medical school in that country. Q: Why is Cornell well-positioned to develop a technology campus in New York? Huttenlocher: Cornell is a major source of technology leadership in this country. When you look at companies like Amazon, Cisco, Intel and Qualcomm, … key technical leaders are from Cornell. What we are looking to do with the technology campus in New York is to accelerate the preparation of leaders who will contribute to creating and managing the largest and most influential technology companies in the nation. And moreover, we're looking to develop new companies in the city of New York, creating jobs and stimulating the economy. Q: How is Cornell poised academically to lead the New York City tech campus initiative? 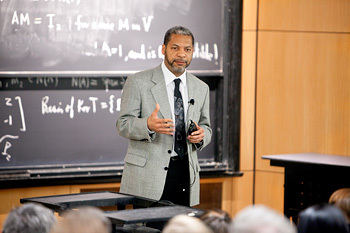 Lance Collins, dean of the College of Engineering, speaks to prospective students on campus. Lance Collins: We have a top-rated College of Engineering, a top-rated Computing and Information Science program, an outstanding electrical and computer engineering department, expertise in advanced materials, and in nanotechnology, we are one of the premier universities in the country. It's important to have strengths in all these areas to create new technologies that will be commercially viable. Also, we have a culture for interdisciplinary research that we will replicate in New York City. This culture has developed over decades and involves a combination of an administrative setup and a campus personality that allows us to interact in ways that cannot be found at most universities. Fuchs: Interdisciplinary research allows an organization to take a breadth of experience and apply it to new problems. It's those new problems that we are going to tackle with the New York City initiative. We have our College of Engineering and faculty of Computing and Information Science, but we can contribute in so many other areas: We have leading faculty in agriculture and life sciences; industrial and labor relations; architecture, art and planning; human ecology; our Johnson Graduate School of Management; and our law school. It is our strengths in these disciplines, in conjunction with computer science and engineering, that make us uniquely suited for this project. Cornell students Raymond DiFelice and Di Li, part of the Cornell Financial Engineering Manhattan program, near Wall Street in 2009. Q: How do you envision this campus in a few years? Collins: I expect to see leaders of major corporations and smaller and intermediate companies, along with students and faculty, teeming through the campus at all times. It's this kind of activity that really spurs economic development in the tech sector. It's these unanticipated connections made between people with different areas of expertise and different backgrounds that will fuel our tech ecosystem. Huttenlocher: The right academic partner can serve as a meeting point for investors, entrepreneurs and corporations, and as a magnet that brings the very smartest and best from around the world. In a few years, I envision a campus full of seasoned entrepreneurs working with Cornell students, taking their ideas, getting them in front of lead customers, and iterating those ideas quickly to get them out into the marketplace in the form of new companies, or new products at existing companies. Q: What is the most important thing a Cornell-New York tech campus will accomplish? Collins: It will generate technology on its own, and that will be exciting. But what's even more exciting is it will generate trained students who will go off and start new companies that we couldn't envision on campus while we were training them. We also have 50,000 alumni already in New York City. The presence of this campus will exponentially grow that number, particularly in this vital area of the technology sector. Fuchs: Cornell has a commitment to economic development in terms of its very foundation laid 150 years ago. We have a commitment to the state of New York, and the New York City initiative gives us the opportunity to keep fulfilling that mission. Creating jobs and transferring technologies to the workplace are part of our objectives as an institution. Q: What does Cornell have to offer New York City, and how would having a technical campus in New York also benefit Cornell? New York City is home to more than 50,000 Cornell alumni -- including thousands already working in the tech sector -- and about 5,000 Cornell employees. 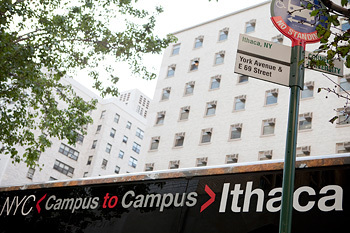 Above, one of the two Campus to Campus Bus stops in Manhattan that provide direct service between the Manhattan and Ithaca campuses. Huttenlocher: Currently New York City does not have an academic institution that produces technology leaders like Cornell does -- a university that prepares students to become leaders of next-generation technology companies. This involves not just classroom education, not just practical experience, but also deep engagement with the process of formulating and asking and answering questioning about technology and technology innovation. And that is something Cornell does extremely well. By bringing together Cornell students, faculty, startup companies, venture capitalists and larger more established companies into what I'll call this cauldron of innovation in New York, we will accelerate the pace of technology innovation. And that will be important to driving the research mission of the university, as well as incredibly important to the creation of new jobs and new companies in the city of New York.